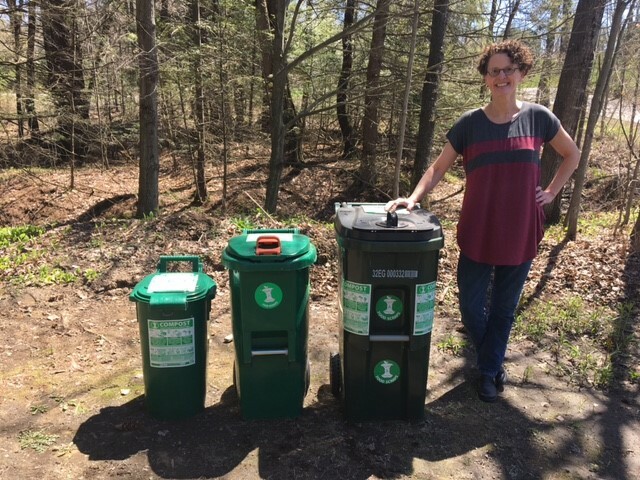 CSWD has a small supply of recycling and compost collection bins you can borrow at no charge to help reduce waste at your next event. Submit the online Event Bin Reservation Form to request your bins. Requests are fulfilled on a first-come, first-reserved basis. We will contact you to confirm availability or get more information once we receive your form. Pick up the bins at the CSWD administrative office. 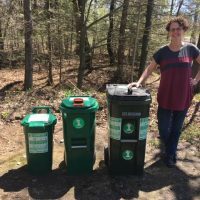 Place recycling containers (and composting carts, if you’re using them) next to every trash can, and make sure ALL containers are clearly labeled (we have free stickers you can use to label any non-CSWD container). Dispose of all trash, recycling, and compostable materials appropriately (see disposal options below). 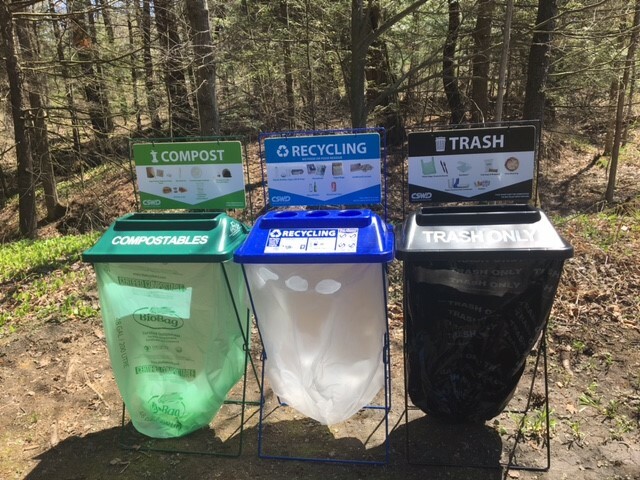 Don’t forget to count how many bags you collect (for each material) so we can track how much the loaners bins are helping to keep out of the landfill. Return EMPTY bins to CSWD along with the event data form showing the event’s attendance and the amount of waste produced. Bins must be returned in the same condition they were in when they were picked up. 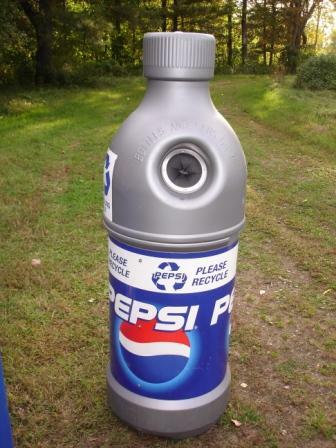 When you are finished, you have a few different disposal options for the materials generated at your event. 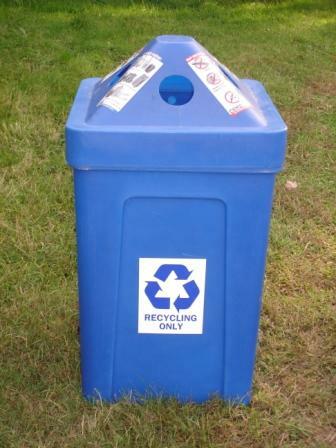 Please note that you should always empty recyclables out of plastic bags into dumpsters or roll-off containers. Recycling facilities do not accept plastic bags or filmy plastic of any kind. 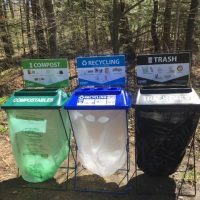 Hire a private hauler – contract with one of the trash & recycling haulers in Chittenden County for pickup of your event waste. Drop off small quantities (less than 1 cubic yard of recycling, 1 cubic yard of trash, and 30 gallons of compostables) to a CSWD Drop-Off Center. Drop off large quantities to a facility that accepts large loads. Order your bags ahead of time! It is rarely possible to find bags of the correct size locally. Search for bags ahead of time online, and order them to make sure they arrive before your event. Learn what size bags you need. The size of the container you are using is not the size bag you will need. In order to figure out which size bags you’ll need, check out this size bag calculator, or reference this can liner sizing guide. Use different colored bags for trash, recycling, and compostables so you can tell the bags apart after you take them out of the containers. Recyclables must be loose in the recycling dumpster. If you use plastic bags for collection, dump the recyclables out, then reuse the bags or dispose of them as trash. Compostable bags are not as strong as plastic trash bags. To make sure your compostable bags don’t break, leave the full bags in place, and dump the containers out at the disposal site. You can also line the container with a traditional plastic bag first, so it will be there to catch the mess if the compostable bag breaks (at the disposal site, you’ll have to dump the compostables out and take the plastic bag home with you) – or just use plastic bags and plan to empty them all.